봉림사 법당에 모셔져 있는 목불좌상으로 1978년 불상 몸에 다시 금칠을 할 때 발견된 기록을 통해 고려 공민왕 11년(1362)을 하한으로 아미타불상이 조성되었음이 밝혀졌다. 얼굴은 단아하고 엄숙한 표정이며 무게있는 몸은 단정하고 앞으로 약간 숙여져 있다. 양 어깨를 감싸 흘러내린 옷은 가슴에서 매는 띠매듭이 사라지고, 3줄의 옷주름이 묘사되어 특징적이다. 전체적으로 고려 후기를 대표할 만한 뛰어난 작품이다. 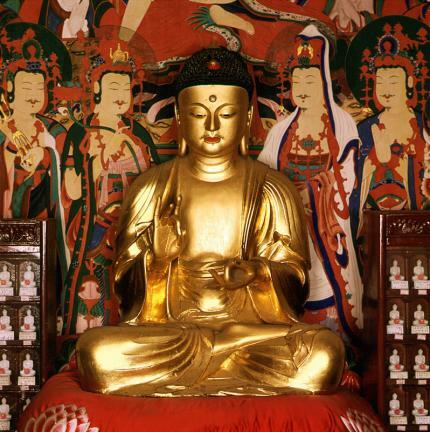 This seated wooden Buddha statue is enshrined within a sanctum of Bongnimsa Temple. When it was gilt in 1978, records on construction and repainting of the statue were discovered, revealing that this Amitabha Buddha statue was made in 1362 (11th year of the reign of King Gongmin of the Goryeo Dynasty). The face is refined and solemn, and the heavily expressed body is well-made up and slightly bent. The robe is draped over both shoulders, with the belt knot on the chest missing. It has unique pleats of three lines. Overall, it is an excellent representative of the Buddhist statues made at the end of the Goryeo Period.